In one way or another every public policy debate ultimately comes down to a decision between whether resources are best kept by the workers, entrepreneurs and businesses that create them versus government extracting resources through taxation and borrowing to use for the priorities they deem more important. There are important lessons to be learned by contrasting the approaches to the size of government and subsequent economic results of the Chretien and current Trudeau Liberals. There are two measures by which to gauge the size of government. The first is per person spending. By this measure, the Trudeau Liberals have implemented a historically large role for government. In 2018-19, the fiscal year that just ended, the federal government spent more money per person (program spending) in the history of Canada, which includes the Great Depression, the Second World War and the more recent Great Recession. Specifically, in 2018-19, per person federal program spending (adjusted for inflation) reached $8,869, roughly $23 more than the previous all-time high recorded by Prime Minister Harper’s government in the depths of the Great Recession. 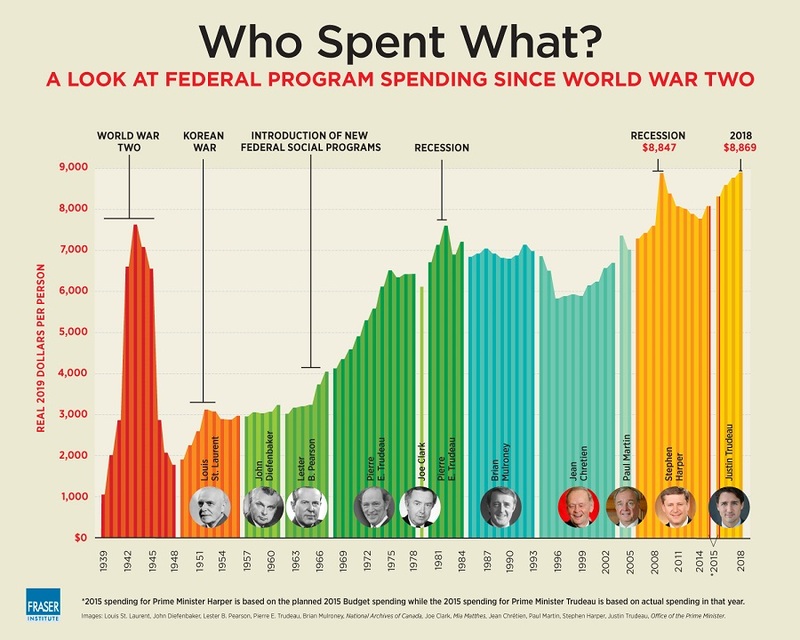 Put differently, the 10.2 per cent increase in inflation-adjusted per person spending implemented by the Trudeau Liberals means that current spending is at historic levels with no comparison when one considers that the previous peaks all occurred during wars or recession (see chart below). During the early reform period of the Chretien government, per person spending (adjusted for inflation) was reduced by 16.5 per cent, from $6,955 to $5,806. Spending increased over the coming years but was still lower at the end of the Chretien years than when the Chretien Liberals took office. For reference, current per person spending by the Trudeau Liberals is one-third higher than the per person spending level at the end of the Chretien era. Another way to measure the size of government is to compare government spending with the size of the economy. It measures the degree to which the government is involved in directing the resources of an economy. Since taking office in 2015, the Trudeau government has increased the share of the economy consumed by government spending by 12.2 per cent. More specifically, federal government spending has increased from 13.0 per cent of the economy to 14.6 per cent. This stands in stark contrast with the Chretien government, which reduced the share of the economy consumed by government spending from a high of 17.1 per cent the year they were elected (1993) to a low of 11.8 per cent in 2000-01. It subsequently inched up slightly under both Prime Minister Paul Martin and Prime Minister Harper. 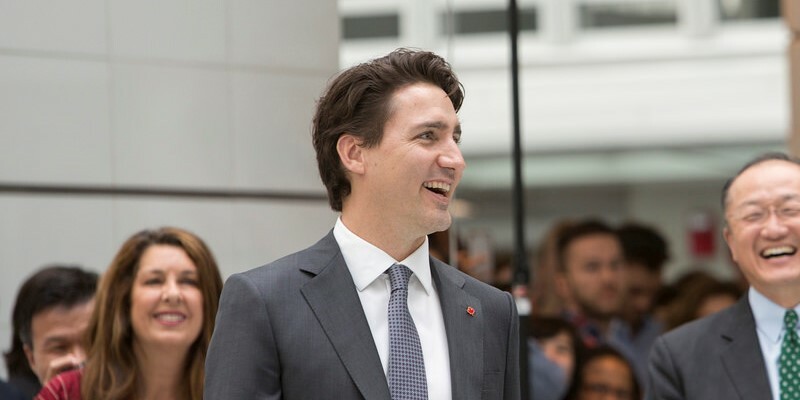 The larger size of government introduced under the Trudeau Liberals is important because of the substantial body of economic research indicating that the size of government matters to both economic growth and social progress. The idea is fairly straightforward—when governments focus on needed goods and services and limit their involvement in other areas, both economic growth and social progress are higher than when government is involved in areas where it’s not needed and perhaps has no comparative advantage. The data for Canada, most recently updated in 2013 by Prof. Livio Di Matteo, indicates that the optimal size of government—including federal, provincial and local—is roughly 26 to 30 per cent of GDP when economic growth and social progress is concerned. These numbers generally comport with international research. The most recent projection for Canada’s size of government is a little more than 40 per cent of GDP, well above the optimal level. The reductions in the size of government by the Chretien Liberals were accompanied by strong economic growth, record levels of private-sector job growth, strong investment and low unemployment. Put simply, the Chretien era was an incredibly prosperous period for the country despite the austerity imposed on the federal and many provincial governments. This stands in contrast to the weak economy presided over by both the Harper and Trudeau governments. Recall that government expanded under the Harper government in large measure due to the reactions to the 2008-09 recession. Economic growth expectations have fallen markedly under the Trudeau government from 2.0 per cent when they took office to 1.6 per cent currently. Business investment is collapsing and investment by Canadians outside the country is up 73.7 per cent from 2013 to 2017 while investment by foreigners in Canada is down 55.1 per cent during the same period. Employment rates are trending down in large measure because of demographics, indeed, one of the reasons for the historically low unemployment rate is the decline in labour force participation as more and more Canadians retire. The reality, contrary to the view of this federal government, is that the degree to which governments appropriate the resources of society through taxes and borrowing matters when it comes to economic growth and social progress. The current government has expanded the size and scope of government with slower growth and less prosperity. It’s time to recapture the lessons (and prosperity) of the Chretien era.